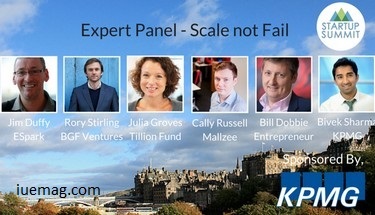 At this years Startup Summit, taking place on 11th November at The Assembly Rooms in Edinburgh, we're delighted to be teaming up with KPMG to host an expert panel discussion on growth and scale, hosted by KPMG Managing Director of Small Business Accounting, Bivek Sharma. We're really passionate about finding partners who can really add value to our summits and programmes, so we were thrilled when KPMG agreed to use their expertise, experience and contacts to help create our expert panel discussion. Since co-founding britishairways.com in 1994, Julia has led a series of start ups in the digital and environmental sectors, and invested a combination of her time and money in a portfolio of sustainable businesses, including Loco2, and most recently Trillion Fund, the UK's leading social crowdfunding platform. telecoms and technology businesses. He has led a number of successful private equity funded businesses since retiring from a 7-year spell at Iomart PLC (IOM) spanning founder to non-exec positions. These include Cupid plc, Maxymiser (recently sold to Oracle) and LendingCrowd as well as actively investing in a small portfolio of Internet businesses :DigitalBox, Tag-Games, Houseology, Logicalware, Avocet and Cloudsoft.